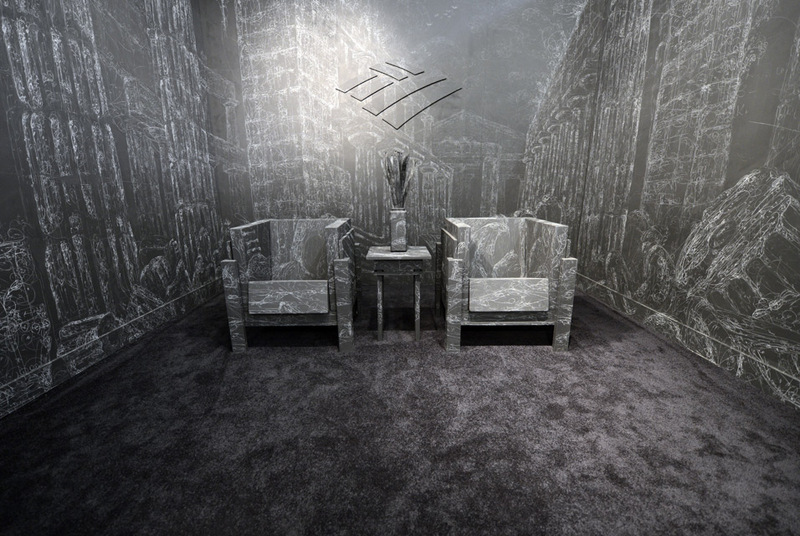 e works of artist Kysa Johnson titled " blow up 203- subatomic decay patterns after Piranesi's Ruins and Waiting Room (Bank of America)" during the press preview at the 2013 Armory Show, one of the world's top art events featuring the most influential artworks of the 20th and 21st centuries, at Pier 92 and 94 in New York March 6, 2013. The Armory Show Centennial Edition kicks off Armory Arts Week . AFP PHOTO / TIMOTHY A. CLARY. NEW YORK (AFP).- The centennial Armory Show, a major annual hub for art dealers, artists and collectors, got rolling in New York on Wednesday. Mayor Michael Bloomberg opened the show, saying New York was "the center of the modern art world." This year there are 214 exhibitors representing galleries from around the world. About 66,000 people were expected to attend the show, which opened with a preview Wednesday and to the general public from Thursday through Sunday, generating $54 million in the city, the mayor's office said. "New York City is truly a global art capital and the art fairs this week present an invaluable opportunity for visitors to interact with artists and artworks from around the world," Art Dealers Association of America President, Dorsey Waxter said. City cultural affairs commissioner Kate Levin called the arts jamboree a chance "for audiences to engage with remarkable artists, galleries, and cultural groups from across the city and around the world." SelfMadeHero and the Rijksmuseum publish a biography of the world's greatest portrait painter.